The portrait of an unknown Girl with a pearl necklace belongs to the Royal Palaces Art Collection. 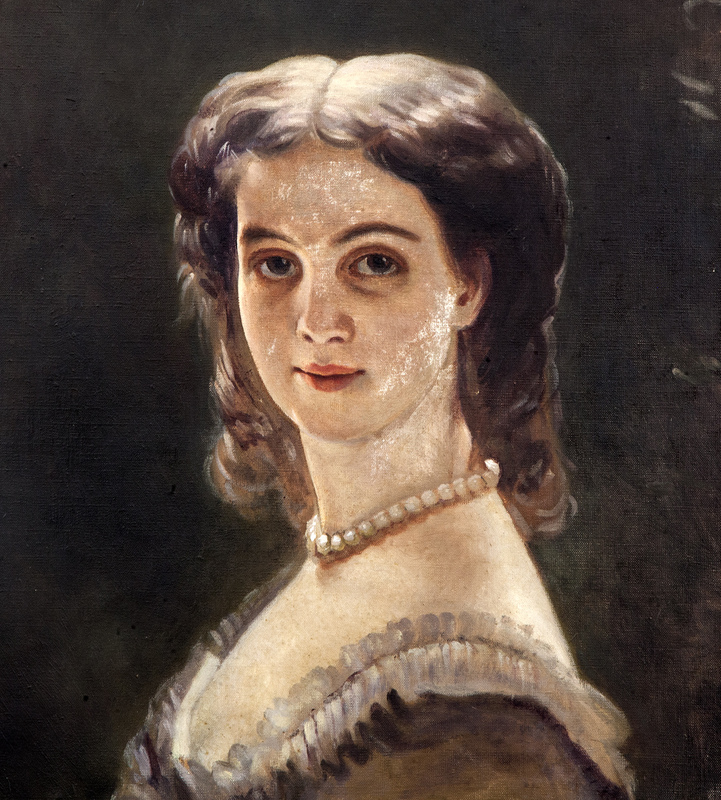 Detailed research of the painting’s origin has revealed that the girl portrayed was a Russian noblewoman Elizabeth Trubetskoy, and that the work is a copy of the representative portrait of her whole figure, made by Franz Xavier Winterhalter. The painting is the result of a commissioned reduction of the original, official portrait. Such practice was usual in the high circles of the eighteenth and nineteenth centuries. As in the case of state portraits, a copy was most often commissioned as a diplomatic and personal gift of the highest importance. Giving one’s own image was a symbol of loyalty to the ruler and thus loyalty to the state. In aristocratic circles, presenting of portraits had a dual function, it was the expression of affection and served as a visual souvenir intended for immediate family. Elizabeth Yesperovna Trubetskoy (1834−1918) belonged to one of the most respected and most powerful family of the Russian Princes. In 1865 she married Alexei Demidoff, and their daughter Aurora Demidoff da San Donato later would become the wife of Arsen Karadjordjevic and the mother of HRH Prince Paul Karadjordjevic. It is this family connection that leads us to the assumption that the painting was purchased before 1946, at the time of Prince Paul. 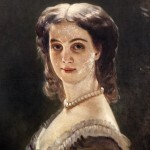 The original portrait by Franz Xavier Winterhalter, made in 1859 (now in a private collection), the reduced copy of which today is in the Royal Palaces Art Collection, Elizabeth Trubetskoy is shown as a young, elegant aristocrat of the mid-nineteenth century. Elongated delicate figure, graceful movements of the head and hands reflect subtlety that befitted Princess Trubetskoy. It is interesting to point out the fact that Winterhalter made this portrait as a copy of the photographic portrait (now kept in the Museum of Orsay) from the same year, the work of Eugène Andrea Desiderius, one of the most important French photographers of the nineteenth century. Winterhalter faithfully painted the luxurious hair and dress of Elizabeth Trubetskoy, while the lush garden where she was photographed he turned into an imaginary landscape of Arcadian nature. Like the best Winterhalter’s portraits, this one, of Elizabeth Trubetskoy, is a brilliant presentation of idealized beauty, where the features of the young noblewoman blend into an image of eternal resident of Arcadia . Although the painting in the Collection is only a small part of Elizabeth’s portrait, one can still see the reflection of the luxurious original portrait in it. Franz Xavier Winterhalter (1805−1873), a painter and lithographer, was born in Menzenschwand in Schwarzwald, Germany. Since 1824 he studied at the Munich Academy and worked at the Ferdinand Piloty’s Institute for Lithography, reproducing images of Dutch, Flemish and Italian masters. In 1828 he became an art teacher in Karlsruhe and began his career as a portraitist. In 1834 he went to Paris and soon gained the favour of Louis Philippe, which allowed him access to the highest circles of European aristocracy. He became a favourite royal and aristocratic artist and one of the most sought-after portrait painters of his era. He received offers from all European courts and among his most famous portraits are the ones of Queen Victoria and Napoleon III. His portraits, painted in the spirit of Biedermeier, with great idealization of the portrayed, were for long a model for a representative aristocratic portrait.